Room Additions | Sarnia | Carosyl Home Additions Inc. If you love your Sarnia neighbourhood, but can’t say the same about your tight living quarters, a room addition can yield many benefits for you. Expanding the square footage of your home can give you the additional space you need, and you won’t have to pack up your bags and move to a new city. 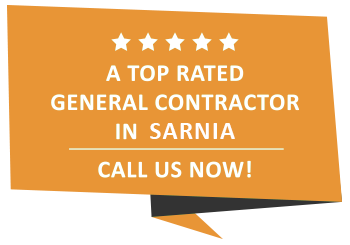 At Carosyl Home Additions Inc., we are a leading general contracting company offering room addition construction to the people of Sarnia and the surrounding area. With more than 30 successful years of doing business under our belt, you can count on us to meet your room addition needs. What are the benefits of building out? More Breathing Room: Additions are especially beneficial for homeowners with a growing family. Whether you are looking to add a bathroom to combat the morning lineup or bedroom to give your children the privacy they require, an extra room can help anyone living in your home. Increased Home Value: Adding a room can significantly increase the resale value of your home. While you may not be looking to move anytime soon, an extra bedroom, bathroom, or sunroom could be the difference between a sale and a bust. Enhanced Curb Appeal: Increasing square footage can give your home a dramatic facelift. An experienced builder can skillfully match a new room with an existing structure to enhance curb appeal. Start planning your Sarnia room addition project! At Carosyl Home Additions Inc., we love taking visions and turning them into realities! Our goal is combine your needs, tastes, and budget to give you exactly what you’re looking for, at a price you can afford. If you are in Sarnia and want to talk about your room addition ideas, give us a call. We are looking forward to having a conversation with you!